Research carried out at the University of Sheffield has revealed intriguing parallels between modern day and Bronze-Age Syria as the Mesopotamian region underwent urban decline, government collapse, and drought. 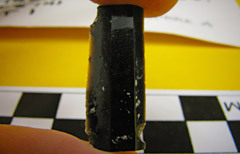 Dr Ellery Frahm from the University of Sheffield’s Department of Archaeology made the discoveries by studying stone tools of obsidian, razor-sharp volcanic glass, crafted in the region about 4,200 years ago. “Unfortunately,” explained Dr Frahm, “the situation four thousand years ago has striking similarities to today. Much like the fall of the Akkadian Empire, a governmental collapse is a real possibility in Syria after nearly two years of fighting. Some archaeologists and historians contend that the Akkadian Empire was brought down by militarism and that violence ended its central economic role in the region. “Our discovery that obsidian in Urkesh came from six different volcanoes before the crisis, whereas they normally came from just two or three at surrounding sites, implies that Urkesh was an unusually cosmopolitan city with diverse visitors, or visitors with diverse itineraries. During the crisis, however, obsidian only came from two nearby sources, suggesting that certain trade or social networks collapsed. It was two or three centuries before diverse obsidian appeared again at this city, and even then, it came from different quarries, signalling the impact the crisis had on trade and mobility throughout the wider region. “One compelling interpretation of our findings is that the regional government of the Akkadian Empire shaped Urkesh’s local economy. This city might have specialised its economy in response to demand from the Akkadians for certain commodities, such as metals from the nearby mountains. With climate shifts and the end of the empire, Urkesh’s inhabitants might have had to refocus their economy on local production and consumption, covering their own needs rather than engaging in specialised long-distance trade. 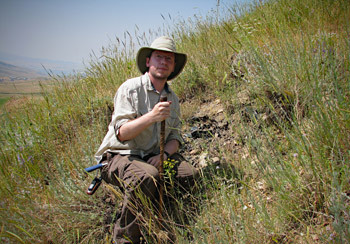 Dr Frahm’s team used a variety of scientific techniques to analyse the obsidian artefacts, including an electron microscope outfitted for chemical analyses, a handheld chemical analyser that can be used at archaeological sites, and a series of sophisticated magnetic analyses at one of the world’s best facilities for studying rock magnetism, the Institute for Rock Magnetism at the University of Minnesota.